Will Balotelli keep his cool in tonight's game? ROME - Two days before the UEFA Euro 2012 finals launched, the Italian soccer squad visited Auschwitz and Birkenau. During the visit, eyes were on star player Mario Balotelli, who has been the target of racist taunts because of his skin color and the fact that he was adopted at age 3 by a Jewish family. Balotelli said before the tournament got underway that he would leave the field the minute the audience began heckling him, but that didn't deter the extremist fans, and they were quick to publish a response that read: "You're black and Jewish and should play for the Israeli team, not for Italy." It appeared that the volatile situation was about to explode, but Italian coach Cesare Prandelli quickly calmed the waters and said that he would respond to every racist comment by embracing his striker. Then they arrived at Auschwitz. As he visited the museum's exhibits, Balotelli showed great interest and took pictures, investigating the events of the past. Toward the end of the visit, Vittorio Pavoncello, president of the Maccabi Italy, approached him and asked to tell the player about his work. "It's important to me that you know that we fight every form of racism and not only anti-Semitism," Pavoncello added. "My adoptive mother is Jewish, all her relatives are Jewish," Balotelli told him, ensuring that all the next day's sports pages would lead with headlines about the Italian star's Jewish mom. Ballotelli's Jewish connection doesn't end there – his sister Cristina studied at IDC Herzliya and some of his mother's family live in Israel, from where they keep a keen eye on his career. 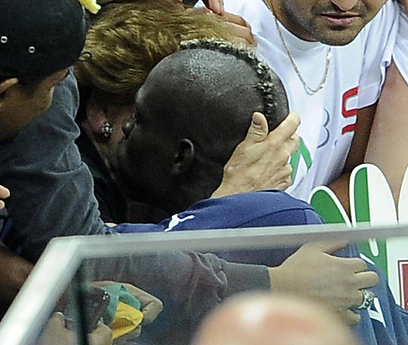 Last Friday, after Italy beat Germany, Balotelli ran to hug his mother, Silvia, and expressed his excitement that she had made the long journey to see the game. "I told her that these historic goals in my career are dedicated to her," he announced. As the most important game of his life approaches, Balotelli's mother has just one request: "Behave nicely (he is considered a 'bad boy' and has a reputation for flying off the handle, especially in the fact of fans' racist insults) and do well." See all talkbacks "Our man on the Italian side "